21. Differentiate between AWS and OpenStack. License The license of AWS is Amazon proprietary. Open Source is the license of OpenStack. Operating medium The medium through which operations are performed repeatedly is by using templates. OpenStack uses text files to perform operations repeatedly. System of operation Operates using system provided by cloud administrator. Operates by AMIs which are put forward by AWS. 22. 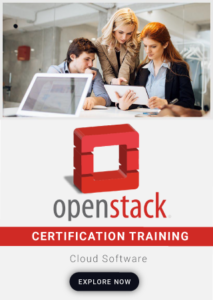 Explain the benefits of using OpenStack Cloud. OpenStack is useful in developing any software-as-a-service (SAAS) applications, for new developments or to improve existing solutions. Can serve as a strong foundation to deliver self-service storage to IT users. Can deliver on-demand objective or block storage with higher scalability and easy-to-handle storage at lower costs. Most enterprises can save bigger on licensing fees by switching virtual machines running on VMware to OpenStack. 23. What are the key components of OpenStack? 24. How do Swift functions? Swift helps in string various objects. It helps in storing objects which are bigger in size and is also numerous in numbers. It helps in reducing data by storing such objects. Its works are often associated with large number sets of data. It contains data which are needed for virtual machines and other apps. Swift also has the capability of media streaming and can also secure a large number of objects stored by it. It has extreme scalability skills and can also help in backing up files and data. Sanitization process refers to the process of the removal of certain information which is present in the media. This type is information are basically useless as these can’t be reconstructed or retrieved. This process mainly includes various techniques like purging, clearing, erasing cryptographically and also destruction. Such process prevents the information to get out to any individuals who are unauthorized during the releases of such information in the media. 26. How can you overcome any type of sudden server failure? During the failure of the server or when the server is not seen to be perfectly functioning then the Object Storage services should not be running. Hence, it is best to close them of this problem arises. This is because to know the solution, troubleshooting must be done. Closing the object storage service will allow it to work or function while troubleshooting is still going on. However, often such failure just needs rebooting and hence for this work which doesn’t require much time, the object storage service doesn’t need to be closed. Update to this service will be added once the machine gets online after rebooting. Removing the drive from the ring is the best idea when the drive can’t be replaced. But if it can be replaced, then it can be added back to the ring. 27. What storage types are allowed by OpenStack Compute? 28. Define ‘users,’ ‘role’ and ‘tenant’ in OpenStack. Users can be members of multiple projects. Tenant is a group of users and an alternative term for Project/accounts where projects are organizational units in cloud processing. 29. Define Identity Service in OpenStack. 30. Define the Networking Managers in OpenStack Cloud. Flat Network Manager: This places all VMs on a single network utilizing the same subnet and bridge as created by the administrator. Thus, all VMs share the same network that can be interconnected and are known to have Flat Network Manager. Flat DHCP Network Manager: Much similar to the above except that the IP addresses to VM are assigned via DHCP (Dynamic Host Configuration Protocol). VLAN: Unlike the single network concept, VLAN facilitates more secure and separate network to VMs. It has a physical switch to offer separate virtual network and separate IP range and bridge for each tenant. This is indeed most preferable choice for multi-tenant/project environment.